Large NYC Townhouse Apt W'burg BROOKLYN 5 Min to Manhattan walk to Apple Store! Please use the EMAIL OWNER button to reach us. We reply promptly. 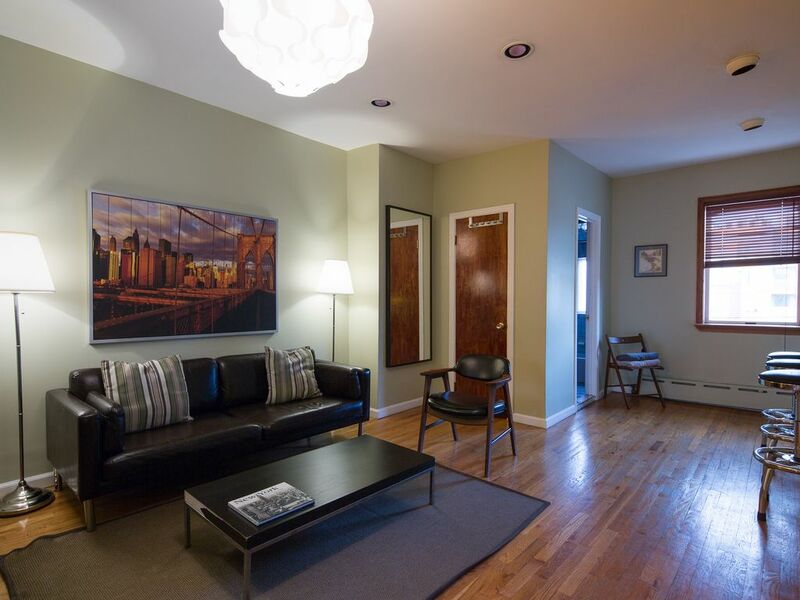 Our home is a typical row house (zoned R6B), making us exempt from NY short-term rental laws. Our townhouse is perfectly situated on a quiet residential street in Brooklyn's hippest neighborhood: Williamsburg. The area is packed with great restaurants, bars, deli's, bakeries and vintage stores. Nearby is McCarren Park, The Knitting Factory, and Union Pool. On our block alone: Chimu, a Peruvian steak house, M Noodle, Kings County Chinese (nouveau), Setti Pane Bakery. French, Japanese, Southern BBQ, Italian all a short walk away. As is the new Apple Store. The neighborhood is also a magnet for young people moving to the city and an influential hub for indie rock, hipster culture, and the local art community. We regularly host parents from all over the world who are visiting their children and grandchildren. Union Square/14st St in Manhattan is 7 minutes on the subway. We are 20 minutes from downtown Manhattan and to Times Square. Closer still to the West and East Village, Soho, Tribeca, Union Square and 5th Ave via the popular L TRAIN subway line: One minute from our townhouse and then a 5 minute ride into Manhattan. This is a private apartment with a private entrance. The spacious living room is open to the kitchen & dining area so there's plenty of light and air. The rear windows both lookout into the private garden in the backyard. The front windows look onto the street and front garden. The entire apartment is newly furnished, linens and a fully-stocked kitchen. A perfect home base for your trip to New York City. Owners live on site, in a separate residence. My husband and I both work in Manhattan and take the L Train to work. I'm a television producer, my husband a Broadway actor. Our daughter attends high school in Manhattan. I'm from Toledo, Ohio and my partner is from Melbourne, Australia, so we have LOTS of family and friends visiting us all year round who now stay in our rental apartment and use it as their home-away-from-home. We love helping them find their way around the city and will gladly offer you a few suggestions about NYC as well. We bought this townhouse in 2010 after living in the middle of Manhattan for 16 years and have fallen in love with our new neighborhood. Our previous neighborhood was very old-school residential with massive apartment buildings, while Williamsburg is filled with 3-story townhouses like ours where the neighbors all sit on the front steps and enjoy the street life. The huge influx of artists and young people who recently 'found' the neighborhood because of it's close proximity to Manhattan and relatively inexpensive housing make for a VERY interesting mix on the street and we love it. What's great about staying in Williamsburg is the EASY access to all the major sites around NYC: Union Square Shopping and Farmers' market, Times Square, Broadway, Macy's, the Empire State Building, all the museums, Central Park and the Statue of Liberty. But what's really enjoyable and a real delight are the VERY walkable streets around us packed with both the old-world shops (the perfect cappuccino at Setti Pani Italian bakery), vintage clothing, side-by-side with art galleries, great restaurants, stores and fun finds (graphic comics books from around the world at Sparacino's). Dont leave W'burg without trying Kings Count Chinese just around the corner on Skillman Ave. Extra Queen size inflatable Aero Bed in all apartments. Full bath and shower. Fresh towels, soap, shampoo and hairdryer provided. In window AC during warmer months. Our townhouse has steam heating. Egyptian cotton sheets & towels provided for 6 guests. There is free on-street parking on our block, the surrounding blocks and a short walk away beneath the BQExpressway. A small selection of spices, tea coffee. Olive oil. A full kitchen stocked with cutlery, crockery pots and pans, dishwasher, microwave, toaster, tea and coffee, a tea kettle, coffee maker, paper towels and napkins. Iron and Ironing board. Roku. Spectrum TV. Netflix. Hulu. Amazon Prime. A coolection of Movies on DVD. Beautiful front garden during warmer months. Seating. Useful for smokers. Mccarren Park has summer and winter tennis courts. 5 minutes away. Mccarren Tennis Club administrate the winter tennis bubble. Mccarren Park has a massive community pool 5 minutes walk away. There is a small garden seating area in front of the house. New Yorkers are famous for sitting on their stoops and watching the world go by. Love Brooklyn, Love NY, Love the owners. Apartment is in a perfect location to everything. Highly recommend staying here. Great place to stay! This was a great house to stay. Had everything we needed after long days of running around NYC site seeing. Can't say enough about how convenient it was being so close to the L train. Fast ride right into Manhattan with lots of connecting trains to take you anywhere. So many times we left too early thinking it might take longer to transit. Will defiantly look at staying here again should we come back to NYC and will recommend family and friends to look here. We arrived at the apartment shortly after 4pm to check-in. Sean provided the code to a lock box that was to contain our keys to the apartment. There were 4 lock boxes at the front of the house. 2 of them were labelled with the same name that were to contain our keys. We tried one and it opened right away but was empty. We tried to open the second box with the code we were provided but it would not open. We texted Sean who replied by saying he would speak to his cleaning people. We did not hear back for over 10 mins and texted him again. He then replied saying he would be home shortly. When he finally arrived he went directly behind the gate into his home and came back out with keys. He took us up to the apartment and let us in. At no point in our interaction he did he apologize for the inconvenience. He then curiously said that he would go and check the lock box for the keys. Curious because, he could have checked them right in front of us as soon as he arrived but he did not. He then came back to the apartment and claimed that the keys were inside the lock box but that we had just failed to flick it open. I find this hard to believe as we attempted many times to push the lever open. The code for the second lock box clearly was wrong. I know it was wrong as I later tried opening the lock box and it opened easily. The code had obviously been changed. Mistakes happen, however this interaction could have been so much better had he simply apologized for the error and was honest about it. The apartment was as expected based on the photos. It is older, so a bit run down, especially the washroom, and the windows are quite drafty. It is fine for a short stay and all amenities you needed were provided. The location was excellent for easily taking the subway into Manhattan. We had a car and found that finding a parking spot at the end of the night was easier than during the day as the area can be quite busy. This is rich. I have no reason to lie to my guests. This is sheer libel by a person who failed to open a lockbox WITH THE CORRECT COMBO in spite of the comprehensive instructions provided. This “review” is shameful; a fabricated fable. Scan through any of the 100s of reviews of my three apts over the years and you will find nothing that resembles this defamation of my character. The combo for the lockbox has remained unchanged for 8 years - and I have emails to thousands of guests over those years proving that. This guest simply failed to open the lockbox which hundreds of others have successfully done. When I received the initial text from these guests that the key was not in the lockbox I responded immediately that I would work it out. I was heading into the subway at the time and just 10 minutes from home. I had no wifi again to send a second response until I was walking down my block to assist them - literally 10 minutes after they first contacted me. I explained that to them when I arrived. In an effort to get them inside as quickly as possible - since they were clearly disgruntled AND THEY’D TOLD ME THE KEY WASN'T IN THE LOCKBOX - I did go and get another key. I then helped them upstairs with their luggage. In the apt there was only one set of keys which is why I immediately headed back downstairs to the lockbox to find the second set. Lo and behold the keys WERE in the appropriate lockbox, which this guest had failed to open. If, as a guest, you can’t wait more than 10 mins for the host to fix your problem and then would feel justified in creating a ridiculous story to defame this host, PLEASE stay in some hotel next time, because you're not the type of guest any VRBO host deserves. Thank you. Very spacious! True NYC living experience! My husband and I and our 3 kids plus my daughter's best friend stayed here. We had plenty of room to stretch out. The apartment is very spacious and was very clean. We felt very safe walking around the neighborhood. My oldest son lives just a 10 minute walk away so this was the perfect location for us. Close proximity to the subway and restaurants (my daughter loves the Rainbow Bagel store!). And also we parked our van under the BQE for FREE!! Where else in NYC can you get free parking?? Sean was very responsive to any questions I had prior to our stay and was also very helpful when we checked in. A super nice guy! It was a bit hot so we just opened the windows a bit to get some cooler air while we slept. Also the aerobed had a slow leak but what air mattress doesn't leak? We would definitely stay here again. The space was nearby lots of dining options/bars/subway. We didn't spend much time in the unit outside of sleep so can't speak much to the kitchen amenities but everything we needed was available. The unit stayed very warm despite the chilling temperatures in the teens so we cracked a window or two and listened to the sounds of williamsburg. Great place to stay. Right around the corner from the subway and less than 10 minutes into the City. All the convenience without the cost of being in the City. Best reason to book: This apartment is a 1-minute walk to the L Subway line, which takes you directly into the center of Manhattan, so in 5-7 minutes you'll be in Union Square. And our location is in fabulously hip & hopping Williamsburg, so you get both a small happening neighborhood feel as well as immediate proximity to Manhattan. McCarren Park is only five blocks away with running track, skateboard park, playground, tennis and lovely grounds for an afternoon stroll and people watching. 24 laundromat is one block away and a dry cleaners is half a block away. Full grocery store is a 5 minute walk, two small city groceries are a half block away.